Supplementary material reads: "Chernus. Long Beach. Girl shooting. Three negs. show Carol A. Billings, 12, who was shot in back with 30-40 Cal. rifle bullet, being comforted by her mother, Mrs. Marjorie Billings at Community hospital, Long Beach. One neg shows Carol A. Billings, 12, lying on operating cot in Community hospital. 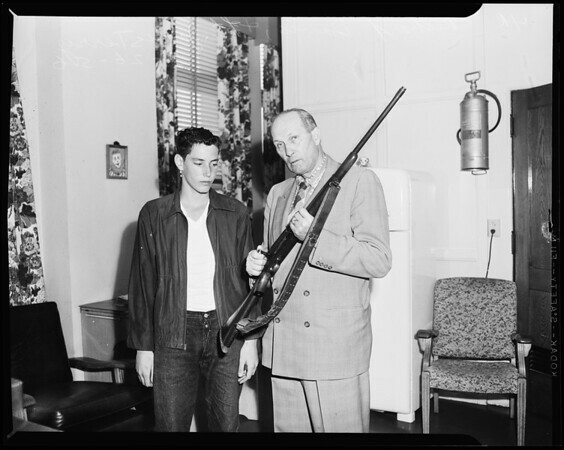 Two negs show Richard Davis, 14, of 33 Riva Alto Canal, Naples, who did the accidental shooting, looking at rifle with Juvenile Officer, Lieutenant James Terry".